MHCET-Law for admission to the 3-year LLB courses consisted of only principle based questions in the Legal section. Major test areas covered in this section were Crime, Torts, Contracts. Just as in the MHCET Law entrance for 5 Year LLB admissions, all questions were principle based and no questions were asked based on legal knowledge. Questions on Constitution were not asked just as in the paper for 5-year LLB. Principles from torts, crime and contracts dominated the section. Overall, a good number of genuine attempts would be 24 + out of 30. And a score of 22 would be considered a good score. Time to be devoted to the section should be around 30 to 35 minutes as the principle-based questions increased the length of attempts. Questions on the GK section were almost equally divided into current affair and static knowledge. Current affairs questions about G20 summit, satellite launches, government yojanas, etc were asked as expected. Questions about rivers and tributaries, dams and rivers, monuments and states, World Wildlife Fund – were also asked. Overall, there were no major surprises in this section. A well prepared student would manage a good score of 30 + out of 40. The reasoning again leaned heavily towards arrangements and puzzles with almost 20 questions from that topic. 4 sets of arrangements & puzzles were asked. Most of these questions were of a moderate level difficulty but took up a lot of time which is a precious commodity in any entrance test. The topic of syllogisms contributed five questions all of which were relatively easy. Both 3-statement and 2-statement syllogisms were asked. five questions from blood relations were asked. Statement – assumptions, statement – conclusions, arguments and assertions, which are generally staples in such exams, were surprisingly amiss in the section. Neither coding-decoding nor series were asked. A good number of genuine attempts for this section would be 25 and a good score of 21+ out of 30 in 30 minutes can be attained. Reading Comprehension dominated the verbal ability section with 2 lengthy passages being asked with topics ranging from status of universities to patents and innovations. Ten questions each were asked from each passage with two questions on synonyms and two antonyms. Five questions were asked on para-jumbles with one para-jumble to be solved and all five questions to be answered on the basis of that one para-jumble. Ten questions of Cloze test were asked. Almost ten questions on grammar were asked in Spotting the Error format. The section was relatively easy. A well prepared student should be able to make at least 42+ genuine attempts in this section with close to 40 correct attempts in 25 minutes. 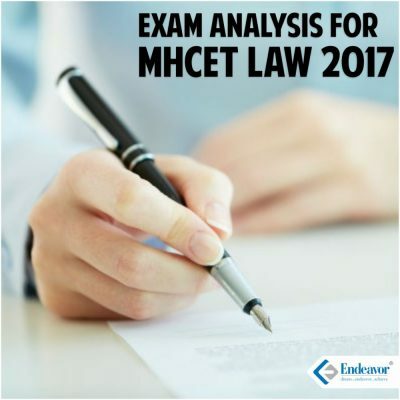 In overall analysis, MHCET LAW (3 years) was a balanced paper along expected lines. Level of difficulty in all sections was again at par with our mock tests. Again principle based questions dominated the section and vocabulary questions were very less. Note: As there was no negative marking, lot of students would have attempted all questions. The suggested good attempt and good score are the net genuine attempts and score obtained from it. I am not to be attempt MH CET LAW exam, can i eligible llb addmission. 5. All Un-aided colleges (including Minority) offering LL.B 3 Year Course, covered as per the Act. The candidate should be an Indian Citizen. who has Graduated/Post Graduated in any discipline of knowledge from a recognized Indian University or Foreign University recognized as equivalent to the status of an Indian University, with at least 45% marks in aggregate or equivalent (44.5% and above will be treated as 45%) and 40 % marks in aggregate (39.50% and above will be treated as 40%) in case of SC and ST applicants. Although a student who hasn’t appeared for the MHCET can rely on institute level seats but the criterion for selection is vague/ambiguous for these seats and such seats are limited in number. It is highly recommended that an aspirational student must appear for MHCET. I like to join on line test series for MHCET LLB 3years 2019. Please suggest a reliable institution. If you are aspiring for 3 years LLB of MHCET 2019, you can join our core CLAT test series, because the entire syllabus is common. Apart from that, we have 7 mocks of 3 years LLB of MHCET in our test series. Check this link for details: https://www.endeavorcareers.com/iendeavor/clat/ Hope this helps.